About 40 miles and 40 minutes north-east of Wichita, Kansas lies the small town of Potwin. The 2010 census put the official population of Potwin at 449. Potwin would be an unremarkable town, situated in the Great Plains surrounded by vast farms and feedlots, if it were not for one unique fact. Potwin is home to a farmhouse with a Lat-Long location of 38°N 97°W. You see, 38°N 97°W happens to coincide with the coordinates, incorrectly, chosen as the geographical center of the United States by a digital mapping company in 2002. 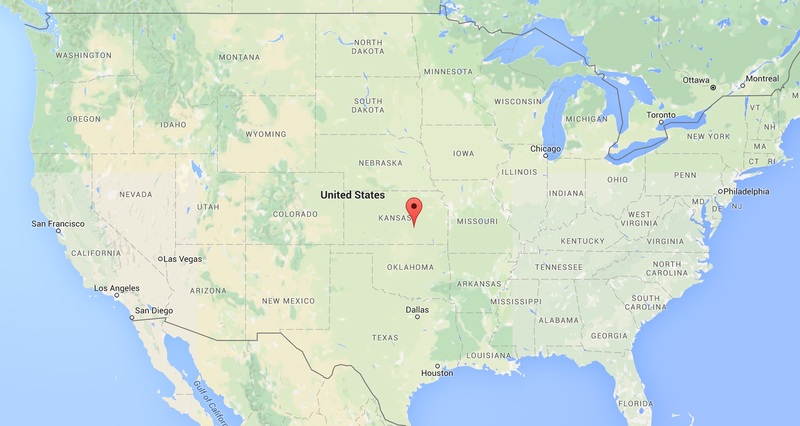 Geographically the official center of the country is 39°50′ N (or 39.8333333), 98°35′ W (or -98.585522), which is a spot in northern Kansas near the Nebraska border. But, back in 2002, a digital mapping company, called MaxMind, decided to round the actual, unwieldy Lat-Long coordinates to 38.0000, -97.0000. These coordinates would become the default point and de facto center of the United States. Now, the internet uses a protocol (IP) to allow any device to connect with any other, via a unique IP address. This allows a message or webpage from one device, say a server, to find its way to another device, such as your computer. Every device connected to the internet has a unique IP address. Companies soon realized that having an IP address, in cyberspace, would be much more valuable — for technical maintenance or marketing purposes — if it could be tied to a physical location. So, companies like MaxMind came along to provide the digital mapping and location translation service. However, for those IP addresses that could not be adequately resolved to a physical address, the company assigned the default coordinate — the center of the United States. Unfortunately, there are now around 600 million IP addresses that point to this default location, 38°N 97°W, which also happens to be the farmhouse in Potwin. This becomes rather problematic for the residents of 38°N 97°W because internet scammers, spammers, cyber-thieves and other digitally-minded criminals typically like to hide their locations, which end up resolving to the default coordinate and the farmhouse in Potwin. As a result, the federal authorities have made quite a habit of visiting this unremarkable farmhouse in Potwin, and the residents now lead far from unremarkable lives. Read more of this surreal story here. Image: Potwin, Kansas. Courtesy: Google Maps.